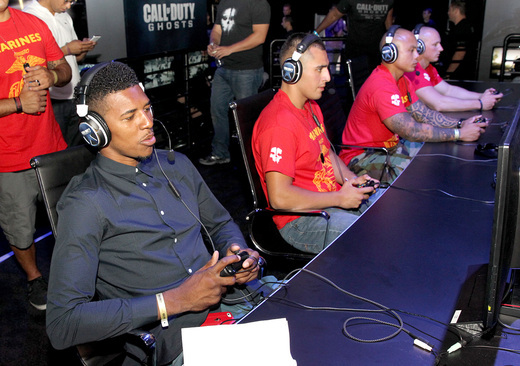 There’s a number that continues to bother Nick Young, and it goes beyond finishing in last place against a pair of Marines in Call of Duty: Ghosts this week during a promotional event in L.A. Live. According to a panel of ESPN writers, the Lakers are favored to finish 12th place out of 14 teams in the Western Conference. So where would Young rank the Lakers? He offered a long pause before providing a vague answer. The Lakers usually enter a season with championship aspirations. But not this year. The Lakers lost in a four-game sweep to the San Antonio Spurs in the first round. The Lakers lost Dwight Howard (free agency to Houston), Metta World Peace (amnesty provision) and Earl Clark (free agency to Cleveland). The health status remains uncertain regarding Kobe Bryant (torn left Achilles tendon), Steve Nash (right hamstring) and Pau Gasol (knees). Despite the Lakers’ financial limitations, they acquired decent talent in center Chris Kaman, forward Nick Young and guards Wesley Johnson and Jordan Farmar. But with the Western Conference featuring plenty of young and emerging talent in Oklahoma City, the Clippers, Golden State Warriors and Houston Rockets, the Lakers face a daunting task in competing with a veteran-laden roster. That leaves the Lakers, for once, using diminished expectations as motivation. For Young, that’s entailed playing in the Drew League, the Los Angeles-based Pro-Am league that features plenty of home-grown NBA talent. To pick up inspiration, Young has frequently played NBA2K13 as the Lakers to receive a sneak peak on how the dynamic turns out. The former USC and Cleveland High of Reseda standout has averaged 11.3 points, 1.9 rebounds and one assist in six NBA seasons, including one year with the Clippers. Young’s athleticism and age (28) suddenly makes him a suitable fit for Mike D’Antoni’s system that usually features a fast pace. With uncertainty lingering on when Bryant will return from his left Achille’s injury, Young’s scoring prowess will come in handy in partly filling the scoring void stemmed from Bryant’s absence. But how will Young and Bryant blend their scoring mentality when they play together? Meanwhile, Young believes Bryant’s past proclamations that he shows more respect toward players who aren’t afraid of resisting his pleas for the ball if they feel they have a better look. That mentality didn’t pay off, however, when he played the Marines in Call of Duty: Ghosts. Both Young and Cavaliers lottery pick Anthony Bennett finished last in the event. How would the Marines fare against Young in NBA2K13? And in Young’s mind, no one wants to go up against the Lakers despite what preseason rankings might say.